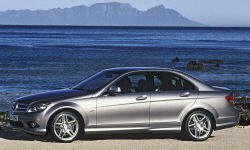 2008 Mercedes-Benz C-Class Pros and Cons | Page 1 of 1 | Why Not This Car? What drives people to buy (or not buy) a certain car? TrueDelta's members share 2008 Mercedes-Benz C-Class pros and cons based on their real-world driving experiences. Very high safety standard and great braking performance. I grew up seeing Mercedes with as many as five 250,000 kilometer badges. These Mercedes were know to last as many as 1,000,000 miles. I line the new body style a lot better than the past C-Class Mercedes. It more refined and stylish. Mercedes-Benz defines location and quality. Furthermore, their tradition in auto racing is so acclaimed. Strong agressive look. Wheels and sport body options make the car look twice as expensive as it is. The navigation / telematics graphics are second to none. The hard-drive based navigation is the quickest thing around and the graphics could have come from my laptop.